These wheels are the updated version of Fingertech's original Mecanum wheels and they've made some awesome improvements. First of all, they moved to an all-metal aluminum design, making them more rugged. Secondly, the rollers are now supported on either side (instead of from the center) which reduces the friction from rollers rubbing against hubs. A small hex wrench is included with each wheel set to tighten the grub screw on the aluminum hub. These will mate directly with our micro gear motors but if you're using it with other motors you can easily drill out the hubs to accept larger shafts. These look like an improvement over the earlier version but they still look like they're not as nice as the Vex Mecanum wheels. Rob is correct about encoder feedback being important. I'm using some Vex Mecanum on a Rover 5. Here's a video of it performing an autonomous figure 8. Encoder feedback is really important particularly when driving wheels at slow speeds. The rubber rollers aren't removable on the Vex wheels. They feel like they have ball bearing inside. When I give a roller a flip with a finger it takes about 4.5 seconds for the spinning to stop (random roller on my bot that's over a year old). The Vex are harder to mount on the Rover 5 than the FingerTech wheels. I have some instructions on how to mount them in post #28 of this thread. Apparently the Vex wheels can be forced onto the Rover 5 without modifying the wheels at all. That's what Legomaniac did here. I am having trouble understanding how to mount these wheels on a shaft. Can some one give me an idea what I need ? i.e. hub connector, shaft coupler, etc. from the picture all I see is 3mm hole for the shaft. If I can purchase those parts on here that be great. Would the hubs on these fit the servo hub on this page https://www.sparkfun.com/products/12274? I want to use some mecanum wheels that could support at least 200 pounds between four of them. I want to motorize my office chair to zoom around the class and for short rides to the school office to get my mail. The only problem is I can only find mecanum wheels for small robots or forklifts. Does anyone know of a middle ground on this? Try andymark, their motors (with gearboxes) and 8 inch mecanums are probably perfect for what you're describing. Be warned though, this will be VERY expensive. For FRC i've spent $1000+ to make a mecanum chassis. Has anyone tested these at high speeds? I can attach these wheels perfectly on micro gear motors http://www.sparkfun.com/search/results?term=gearmotor+torque+micro&what=products ??? 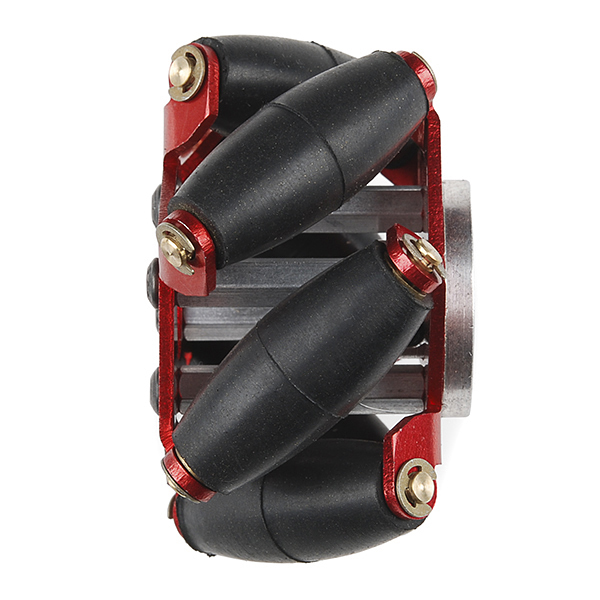 About VEX Mecanum Wheels, how do I attach them to a motor?? The Vex wheels will likely be harder to mount than these. 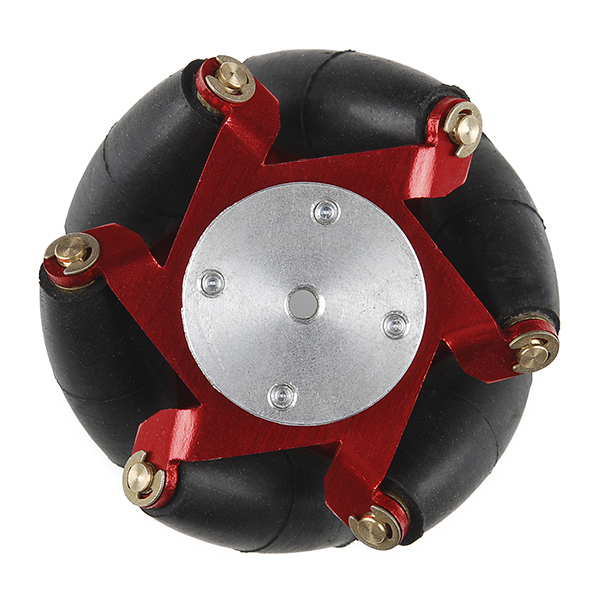 The Vex wheels have a square hole that needs to be drilled out to accept the shaft of the wheel you're using. I think the Vex wheels may be too large for the micro gear motors but they do work on the Rover 5. You either need to drill the hole in the Vex wheel a little too small and use a fiction fit or drill them to the same size as the shaft and drill a hole through the side for a set screw. I have a link to some instructions in my other comment. 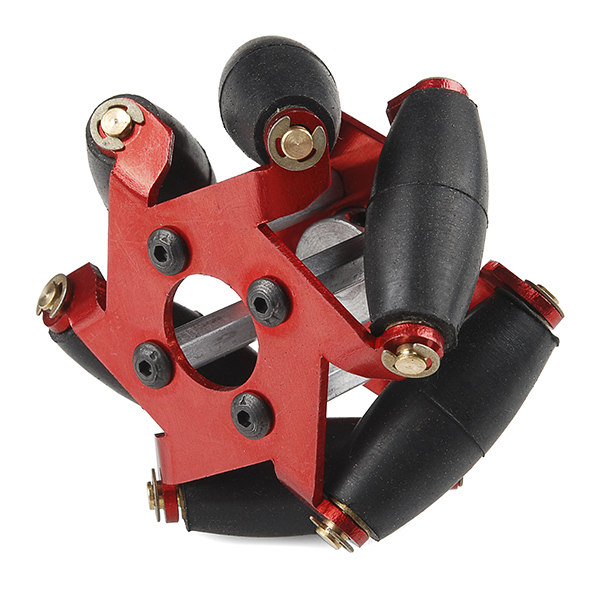 I'm pretty sure the Vex work better than these wheels (and are less expensive) but they will take more work to install (on non-Vex motors) than the FingerTech wheels. The Vex wheels are also larger than these wheels which may be a problem for some motors. I personally like the looks of the Vex wheels, but I don't think they look as nice as these FingerTech wheels. 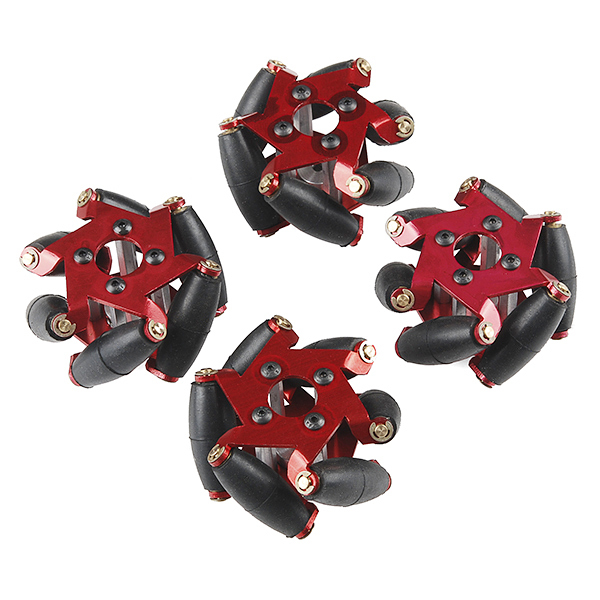 Sometimes the big green Vex wheels will look out of place on a robot while these FingerTech wheels would look cool. We all know that "cool" is an important robot quality. Vex only accepts purchases over 200$? The $200 applies to purchase orders (a form schools and businesses use to purchase stuff). This doesn't apply to normal web orders. If I buy VEX Wheels, Drive Shafts (What size should I buy? ), Shaft Collars (right? ), 2-Wire Motor 269... How do I attach the Whells and the Motors on my robot? I can't find brackets to attach the motor to the robot, like these: https://www.sparkfun.com/products/11278 to attach Mini Gear Motors. I've never used Vex motors or shafts. I'd suggest looking at YouTube videos and other places to see how others have mounted the motors and wheels. I think Vex has a forum. You could ask there. If you're not using Vex wheels with Vex motors then you have to figure out a way to mount the wheels. Here's another example of using Vex Mecanum wheels with a Rover 5. I've also made custom hubs in order to use Vex omni-wheels with Dynamixel AX-12+ servos. See post #44 of this thread for a photo. Sorry but the only way to make sure you don't do something wrong is not to do anything. And that's no fun. 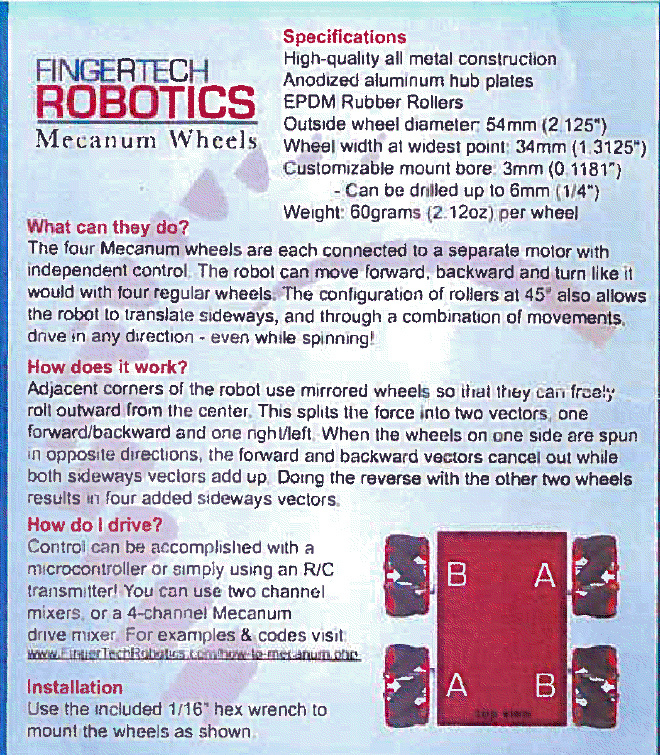 Just one more thing, these mecanum wheels from FingerTech fits easily on Micro/Mini Gear Motors sold here in sparkfun? EDPM rubber rollers. read the datasheet. I have a set of the old version and I plan on buying these, but if the hubplates are anodized aluminum can I really drill them out? It's hard to tell from the pictures, but I think they mean to drill out the milled aluminum HUB (the plain aluminum piece). The Anodized hub PLATES are the red pieces. I think you are getting the two confused. Correct me if I'm wrong. Yeah, they're calling the star shaped wheel bit the "hub plate" and the hub itself is connected to that. The hub is soft aluminum and should drill easily. I'm really nervous about drilling the holes off center. I plan on putting this on the rover 5 which has about 4mm shafts. Any advice? I just popped a set onto a Rover 5. My best advice is step up to the size you need from just slightly larger than the existing hole. The bit will self-center in the hole so you don't have to worry too much about getting off-center. I actually did it with a hand-drill (like a genius) and it worked out fine. Using the existing hole to center your bit should give you the results you're looking for. What Nick said. It's nearly impossible to drill an off-center hole, when there's an existing hole already.